No matter what business you operate in, customers are your lifeline. Without them, you wouldn’t generate any sales, get referrals, or develop new relationships. True customer relationship management helps you better understand your customers and engage with them throughout the entire customer lifecycle. By analyzing data, you can determine what they need or want, and how you can improve your business model. That is why having a CRM should be central to what you do. 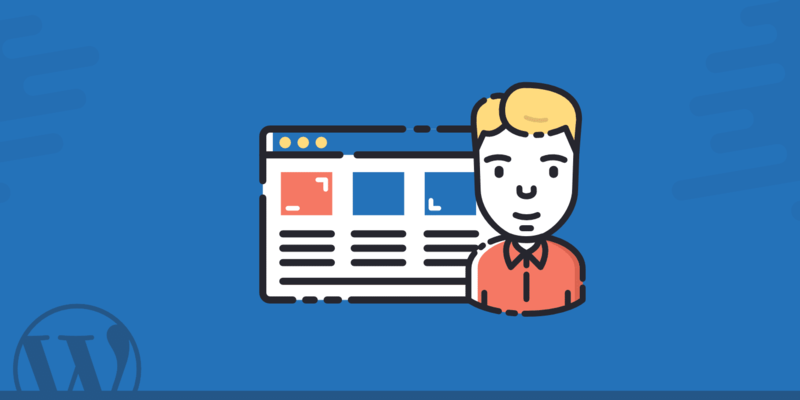 In this post, we’ll dive into the Zero BS CRM plugin, why you should use a CRM and some of the advantages of going with a self-hosted solution. A CRM Sounds Great. But Which One? 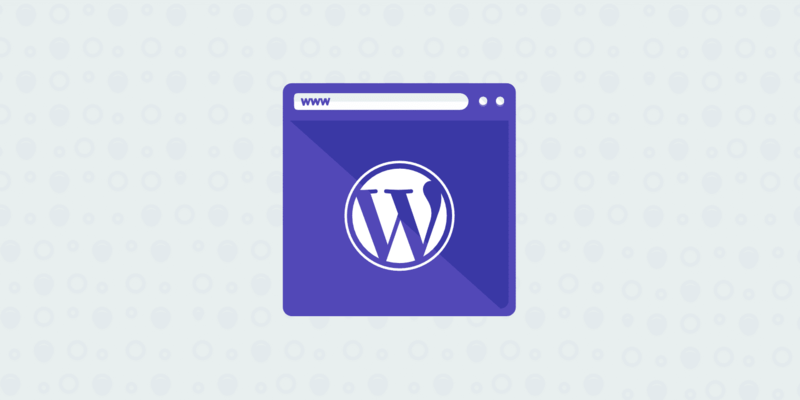 What About a WordPress Self-Hosted Solution? CRM. It’s a term which you may be familiar with. It stands for customer relationship management or client relationship management. You don’t need to run an e-commerce store or even sell to people to call them customers. A CRM can be used for anything that involves managing relationships. But why would you want to do so? Knowing the history of your customers lets you tailor your communications to their exact needs and give them what they want when they want it. And beyond that, it is one of the easiest ways to stay organized! For example, Agile CRM is a nice solution, however, as soon as it starts asking you to modify MX records to be able to send emails to customers and contacts, this can definitely scare average business owners away. It also has a lot of options and panels, which means you might end up paying for features you don’t need, like an appointment booking system. 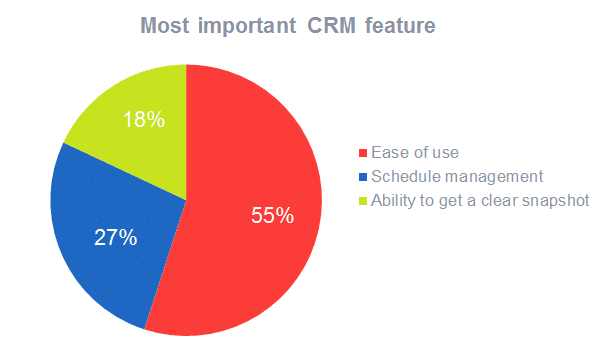 Research by Inside CRM found that 55% of users said ease of use was their most important CRM feature. So sometimes simple is better! These types of solutions also get very expensive fast, as you’re paying for hosting and paying for databases with more and more contacts. Some CRMs offer a per customer payment levels or email restrictions (first 10,000 free, but can only send 5000 emails, etc.). If we take a look at the WordPress repository, there are 21 pages of results for the term “WordPress CRM.” But when looking through them, only a few stand out as true, self-hosted and well-supported CRMs that actually utilize WordPress as the content management system. 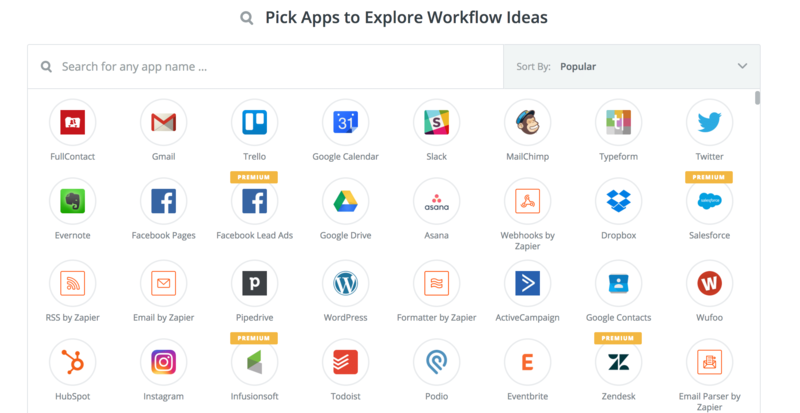 It’s one thing to build a CRM for WordPress that sites on top of it, it’s another to build a CRM for WordPress that actually integrates with it and takes advantage of the already powerful platform. A lot of the other results are WordPress plugin integrations which simply add forms to your WordPress site. These forms then post the data to your CRM (such as Salesforce) and do not give you a CRM from your WordPress website, but rather give you tools to get leads from your site into an externally hosted CRM. 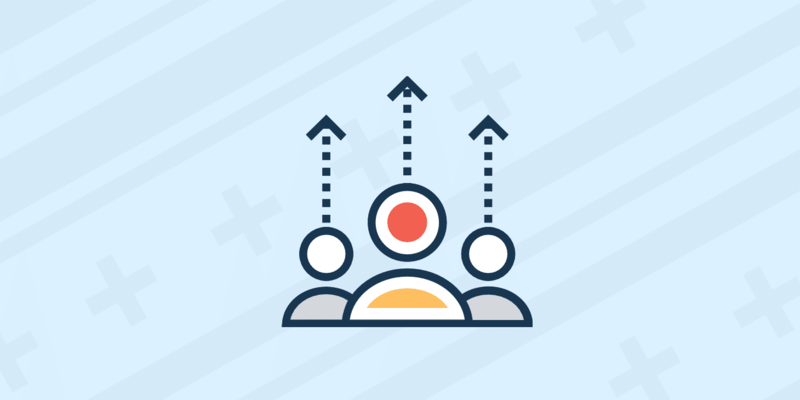 When comparing the features of the CRMs that give you full CRM capability in your WordPress install, one stands out as heads above the rest. Zero BS CRM. And don’t let the name fool you! This CRM plugin is packed full features. Zero BS CRM has recently done a feature comparison against WP-CRM and UPiCRM (you can see the full comparison here). 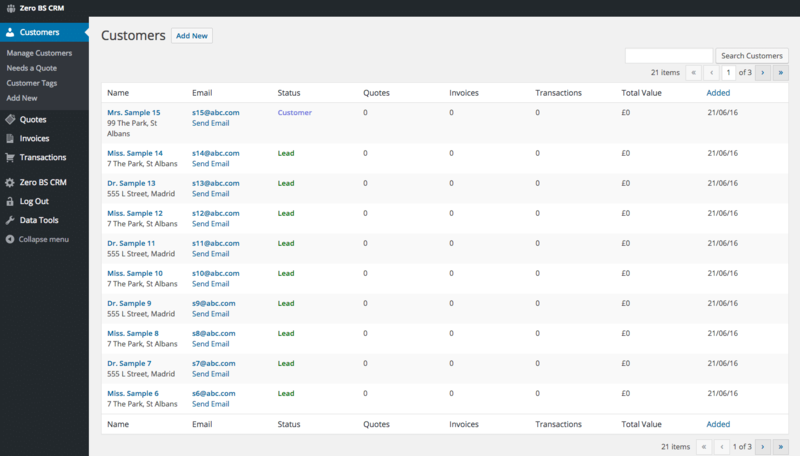 They’ve also included WP-Invoice which is an add-on to WP-CRM. Each of these solutions come with optional extensions to take the CRM to the next level, with the exception of UPiCRM. When testing each of these the UPiCRM didn’t have any paid extensions but was lacking in a lot of features present in Zero BS CRM and WP-CRM (+WP-INVOICE). 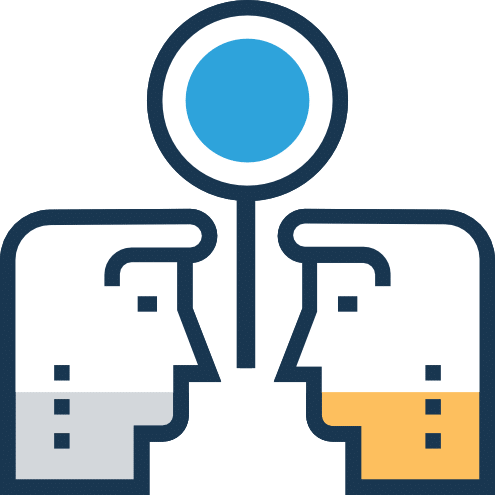 With UPiCRM it enabled you to manage your leads and give other users lead management access but it didn’t do much else (We also struggled with how to use it since there’s no walk-through or welcome pages). WP-CRM and WP-INVOICE, when combined with their extensions, give you a solid CRM but it soon gets quite expensive and we found it quite difficult to figure out what features we needed. In fact, summing up these extension costs you’re looking at $465 a year to run the CRM with all of their capabilities. They offer a bundle, but this doesn’t have all the extensions available, just a limited few. Even with all the extensions in WP-CRM and WP-INVOICE, there’s a lot of things missing such as logging transactions, reporting, and the ability to issue quotes (without having a paid extension). 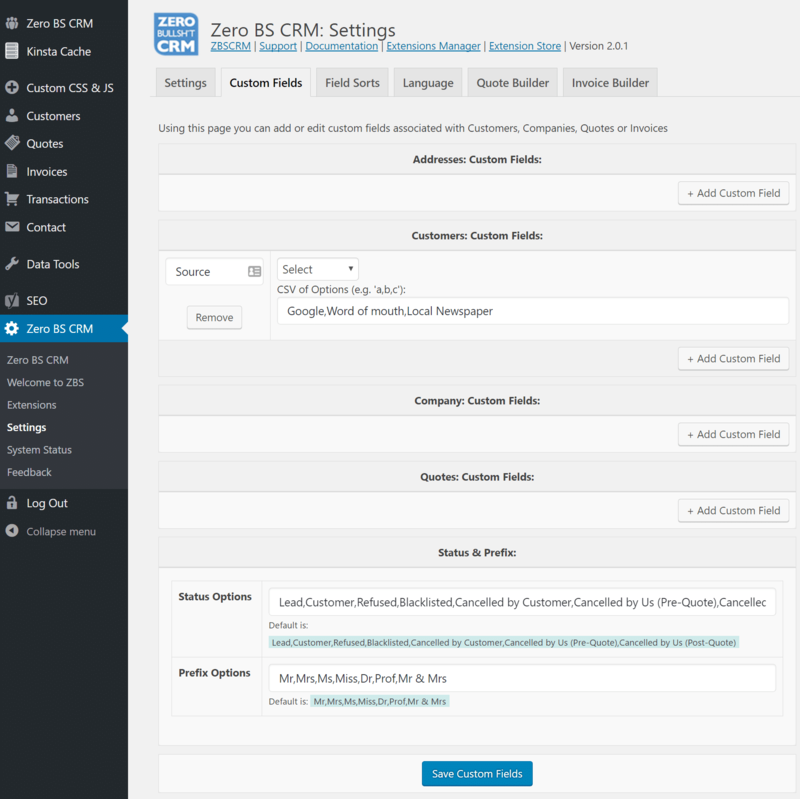 Zero BS CRM has been around for a year but comes out of the Epic Plugins (and Epic Themes) development companies. Even though it is fairly new, these guys are not newcomers to the WordPress space and have built 50+ plugins and 10+ themes. The main attraction to Zero BS CRM is the simplicity and ease of getting started. It comes with an easy to follow welcome wizard which walks you through the settings and asks which modules you plan to use (quotes, invoices, forms, etc). 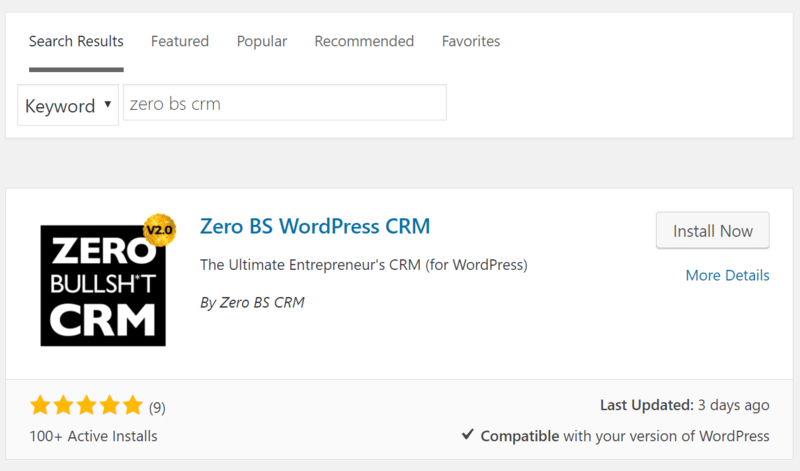 You can download the free version of Zero BS CRM from the WordPress repository or by searching for “Zero BS CRM” within your dashboard. It’s modularized so you’re not presented with loads of options and pages to try and figure out what’s going on. Remember those stats we shared above? People want simplicity and ease of use! This makes it really easy to get going. It even tailors the welcome wizard based on what you tell it. For example, if you’re a freelancer it will suggest that you use lead forms, quotes, and invoices. There are also bundles, such as the freelancer bundle or if you’re a small business it will suggest the entrepreneurs bundle to you. In our example, we chose “small business” as our type. And on the next page, it asks us about adding the PayPal and WooCommerce extensions, as those are probably something a small business would need. Remember though, these are all optional. On the next page, it asks us about additional options that we might want to enable, such as quotes, invoices, forms, etc. And that’s it! 4 easy steps and you are now ready to use WordPress as a CRM. 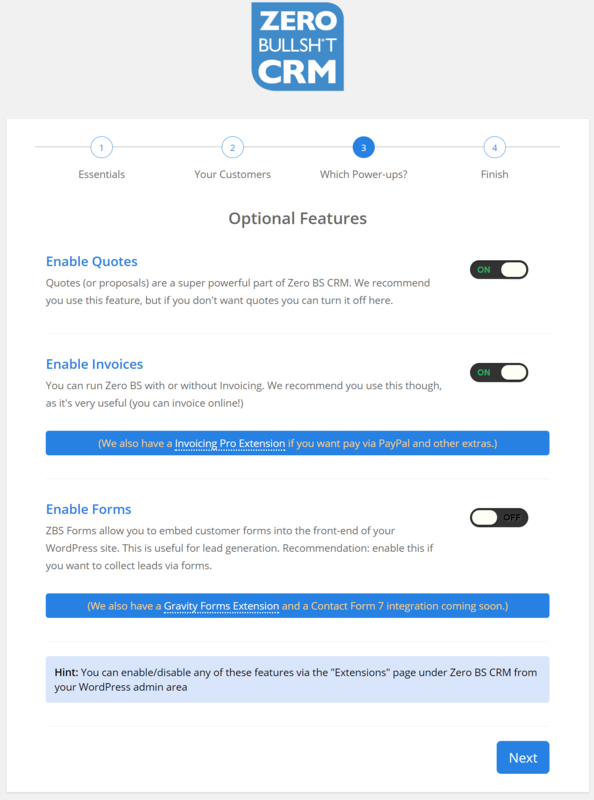 The dashboard of Zero BS CRM is very easy to use and you can quickly access everything from customer data, quotes, invoices, transactions, etc. For those that are a little more advanced, there are plenty of amazing options hidden away in the settings panel. You can create custom fields, change the order of fields, create invoice and quote templates, and much more. You can then manage all of your customers in an interface within the WordPress dashboard that you are already familiar and comfortable with. 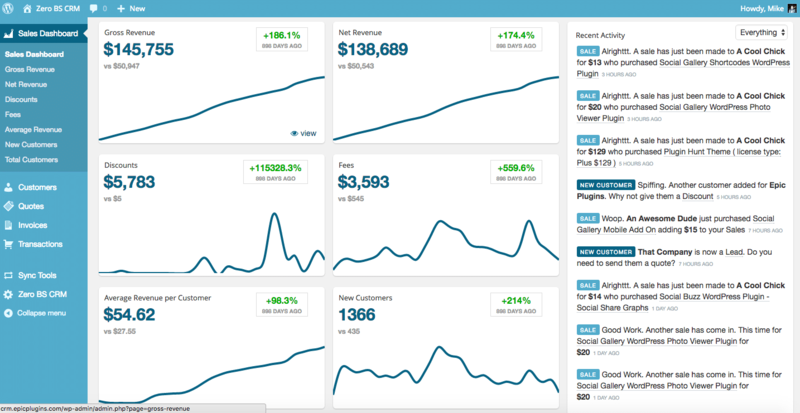 One really cool extension is the sales dashboard. This gives you a “Baremetrics Style” overview of your gross sales, net sales, fees, discounts, customer growth, new customers and average revenue per customer. Another stand out feature with Zero BS CRM is the availability of an API giving the ability to integrate it with a tool like Zapier and program your CRM to do whatever you’d like it to do. The API is included in the free version fo the CRM from v2.0. Zapier is really cool and adds a lot of functionality, free accounts are limited to 5 “Zaps.” So if there’s an extension to do something you think could be done via Zaps (like adding a new customer and transaction following a successful PayPal transaction) then the extensions should be used. This saves your Zaps for the extra automation and exploring new workflow ideas while keeping your CRM central to everything you do. The full features comparison of the CRMs shows that the majority come with an extension type system. 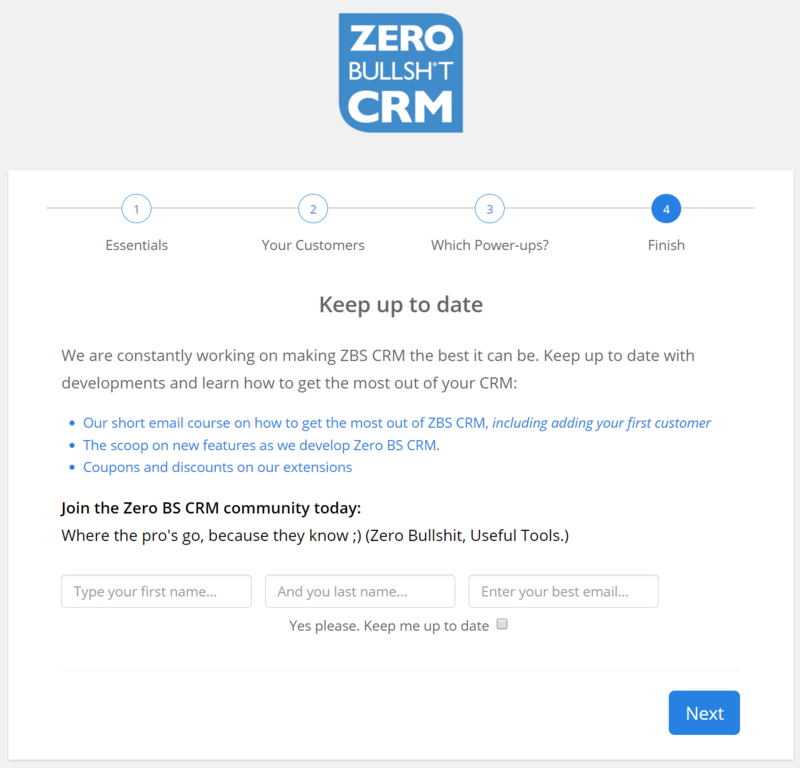 Zero BS CRM is no different and they offer the following extensions. The freelancer’s bundle gives a limited number of extensions hand-picked for freelancers, whereas the entrepreneur’s bundles give you access to everything. The entrepreneur’s bundle extensions package retails at $499 per year (optional renewal) but is discounted down to $199 (since zero BS CRM was launched last year). The renewal price is similar to how WooCommerce and Easy Digital Downloads run large-scale solutions like an e-commerce store. It’s not required for continued use of the extensions but maintaining the subscription gives you continued access to support and future updates of the extensions. If you’re not using a CRM for your business then you really should consider starting to use one. To keep control of costs, using a self-hosted CRM is a no-brainer. And pairing it up with WordPress makes it even more powerful! 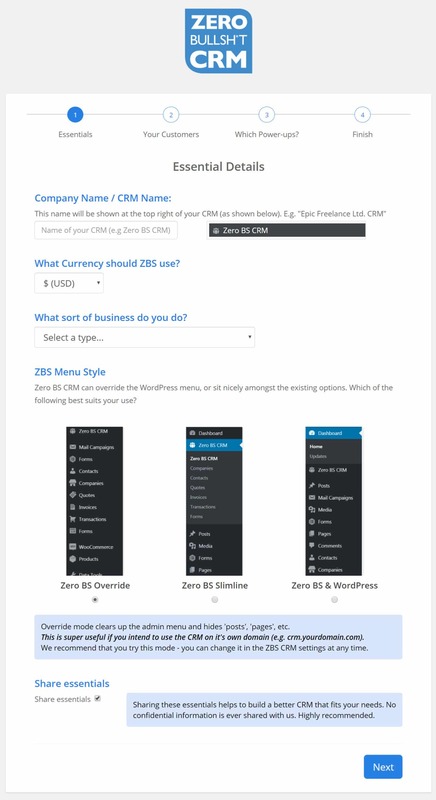 If you’re already using a CRM (such as Salesforce) and want to manage your costs as your business grows then consider a WordPress CRM solution such as Zero BS CRM. If you have a team of 10, paying $30 a month then switching to something like Zero BS CRM can save you thousands a year potentially without sacrificing any features you’re used to in your existing CRM. What are your thoughts? 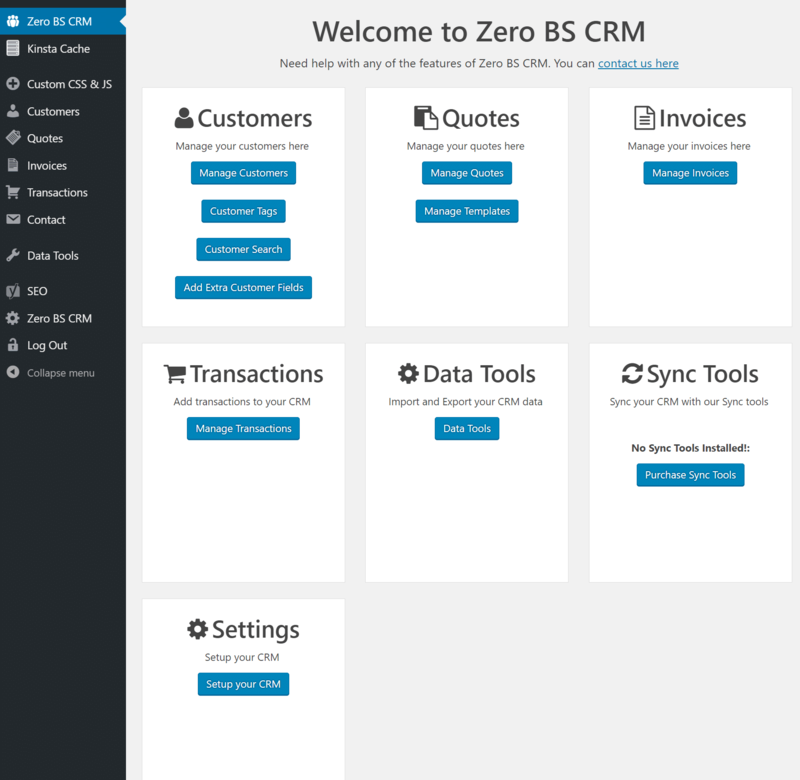 Have you given Zero BS CRM a try yet? If so, let us know below. ZBS is definitely looking pretty solid. The one major thing it lacks, and possibly a deal-breaker for many, is contact syncing with Google Contacts. Yes, it is definitely a plugin to try out. As far as Google contact syncing, it looks like they are happy to add to features to their road map. http://zerobscrm.com/faq/ Could be no one has mentioned that yet.